Cryptolist Christmas printable. 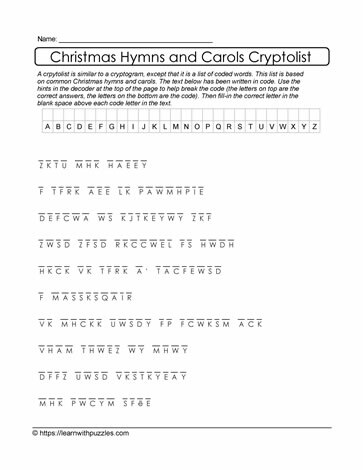 Here is a special Christmas music cryptolist puzzle for students to decipher. Students must decrypt the coded letters to solve the puzzle. Each entry in this cryptogram like puzzle is a well known Christmas hymn or carol typically sung during the festive holiday season. Record the letter substitutions in the table provided. This puzzle engages students' problem solving skills. It is helpful for students to understand word patterns, letter patterns, and titles of the various holiday songs. While this puzzle is suited to students in grade 5,6,7 and homeschooling classrooms, differentiated instruction will help support struggling students and students in earlier grades.